Offering a fundamental change in the way professional managers and individual investors select stock, this book provides guidance on cracking the investment market. acquisitions, and corporate governance issues. He has been a guest columnist forThe Wall Street Journal, The New York Times, Fortune, andBusiness Week.Rappaport's teaching, research and consulting activities focus on applying shareholder value methodology to equity investing, corporate planning and performance evaluation, executive compensation, M&A and corporate governance issues. He has consulted for a wide range of major corporations, financial advisors, and government agencies and has served as an expert witness on valuation issues. His shareholder value framework serves as the foundation for LEK Consulting's worldwide financial consulting practice. He created and designed The Wall Street Journal Shareholder Scoreboard, an annual ranking by total shareholder returns of the 1,000 most valuable U.S. corporations, published annually from 1995 to 2008. Michael J. Mauboussin is chief investment strategist at Legg Mason Capital Management and an adjunct professor at Columbia Business School. 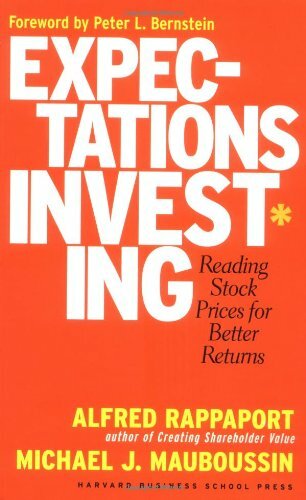 He is the author (with Alfred Rappaport) of Expectations Investing: Reading Stock Prices for Better Returns. investment counsel firm He retired in 1973 to launch Peter L. Bernstein, Inc. Bernstein was the first Editor of The Journal of Portfolio Management in 1974,and is now Consulting Editor of the Journal. He served on the Visiting Committee to the Economics Department at Harvard University, as a Trustee and member of the Finance Committee of the College Retirement Equities Fund, and as a Trustee of the Investment Management Workshop sponsored by the Association for Investment Management & Research. Bernstein is the author of nine books in economics and finance and he has also written articles in professional journals such as The Harvard Business Review and the Financial Analysts Journal, and in the press, including The New York Times, The Wall Street Journal, Worth Magazine, and Bloomberg publications. He has contributed to collections of articles published by Perseus and FT Mastering. He is also a lecturer on risk management, asset allocation, portfolio strategy, and market history. Bernstein has received three major awards from the Association for Investment Management & Research, which include; The Award for Professional Excellence, The Graham & Dodd Award, given annually for the outstanding article in the Financial Analysts Journal for the previous year, and The James R. Vertin Award, recognizing individuals who have produced a body of research notable for its relevance and enduring value to investment professionals.